ColoRADogs is a 501(c)(3) located in Fort Collins, Colorado but doing work throughout the Northern Front Range of the state. 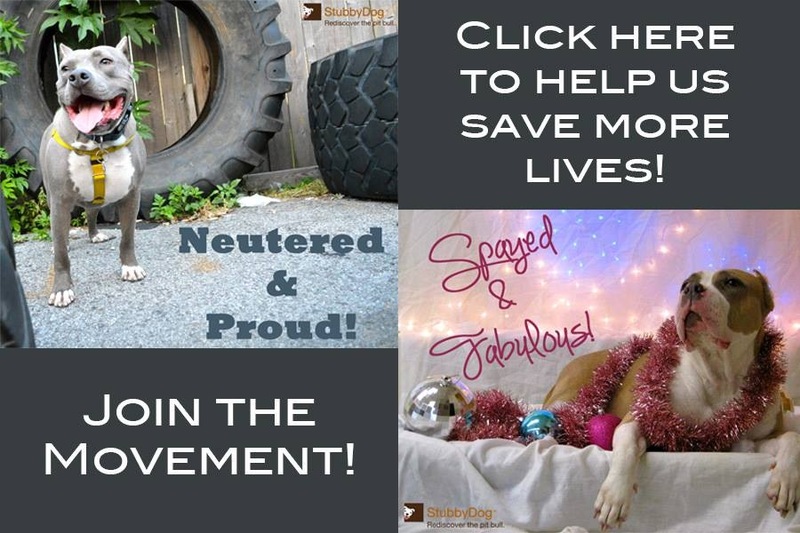 While we do rescue all breeds, our focus is heavily on those described as “Pit Bull” dogs. We have a special love for the little APBT’s found in fight busts, Staffordshire Bull Terriers and American Bullies. 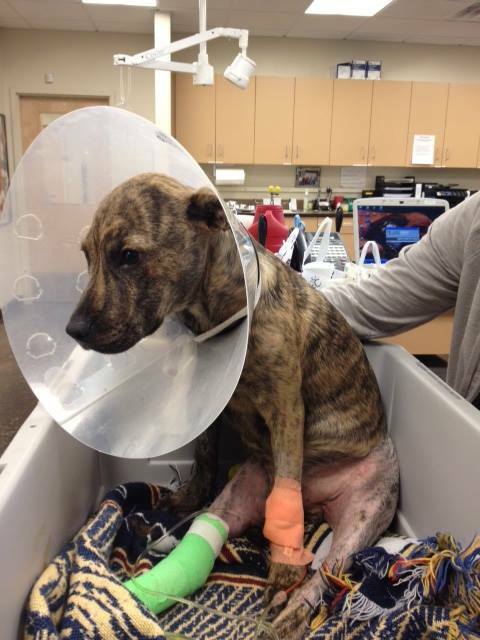 Beck was hit by a trash truck in a BSL area. While we are a small rescue, we try to maximize our impact with the dogs we have. It means we say “no” much more often than we like but when we say “yes”, it is for the lifetime of the dog. Part of our mission is that no dog that becomes a ColoRADog ever ends up in a shelter, or as just a resident dog again. Once you are one of our dogs, you are secure for your lifetime. 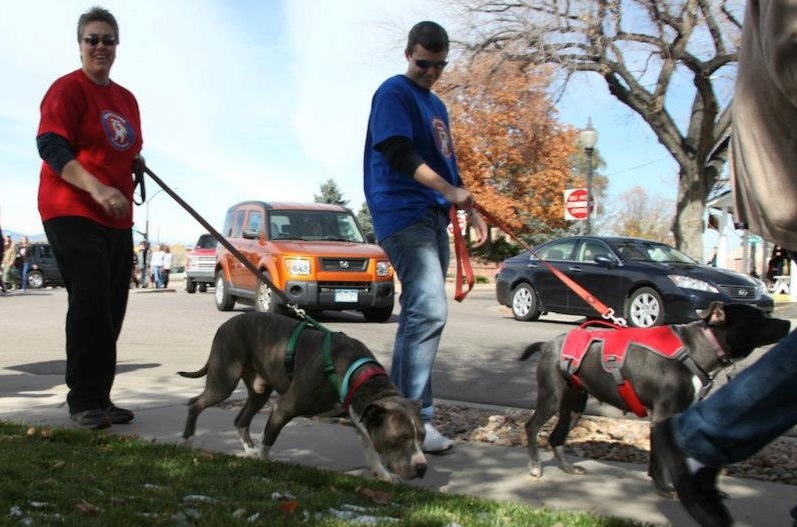 We focus on local dogs caught up in BSL areas in Colorado such as Denver or La Junta. However, we do work with dogs involved in large scale fight busts such as the Oneida, Idaho “triple murder fight bust,” and will be bringing in a little girl from the 367 dog fight bust from 2013. We spent most of last year helping to support Idaho Humane Society with the dogs from their fight bust through not only taking in a few, but working to help transport dogs to other capable rescues throughout the US. Our biggest passion is in the repeal of BSL in Colorado, along with providing resources for in-need communities to foster responsible ownership. Currently we are working to end BSL in Aurora, CO. While we know that Denver gets the most attention, the law is much more oppressive in Aurora, and dogs who end up at their shelter do not see the light of day without legal representation and expensive fines and tests. Most dogs will never make it out of there. We have hope with some community action that the shelter can be “nudged” into focusing on the “care” part of their mission. 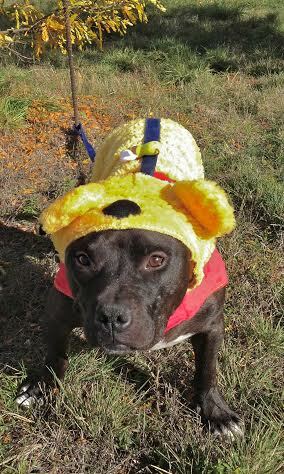 In contrast, Denver Animal Services has been fantastic to work with and will do everything within their power to get blockheads to rescues outside the area. There has been such growth there, and we remind people that they are doing a fantastic job under the worst of circumstances. Our Community Resources Officer, Jen Bryant, has worked tirelessly to open the lines of communication with Aurora City Council members, and develop respectful dialogue among all parties involved. We’ve received tremendous support and can’t say enough about our advocates locally. We hope that Aurora will be the domino that starts a new era in Colorado. We will be addressing Denver in the near future but are working to build bridges one city at a time. In reality, after BSL is gone is when the real work begins. We have offered to partner with the City of Aurora to provide pay-as-you-go services, such as spaying and neutering, vaccinations and training for the community at large, not just pit bull owners. But in the end, BSL affects grants that are awarded, which affects our ability to offer resources. This in turn affects the whole community. We strongly believe that one of the ways to reduce euthanasia is to help keep dogs in their homes and offer help that is based on education and not shaming. Advocacy should be about the whole equation and compassion for both the dog and person. We have tons of tips on that on our advocacy page. We saw some of this early on in our work with at-risk populations and dogs in the Fresno, CA area where our founder lived for 19 years. Her neighborhood had a very high population of gang members who used blockheads in fronting off and street fighting. Instead of developing oppositional relationships, she started speaking to them about why they used the dogs in that manner, and worked to provide a different option to show off their dogs. It took a few years, but what she found was that these young men did stop fighting their dogs and the community message changed for the better of the dogs, and the people who had them, even if it was just in that small neighborhood. That experience stuck and it is what ColoRADogs has been built on. We have a tremendous core group of people. Our founder has done Schutzhund training and decoy work, she’s been a Vet tech, owned a grooming shop, and has worked at a large shelter as the rescue coordinator. She also has extensive experience in lobbying for LGBT, women’s and minority rights. Our board consists of a retired military police officer and K-9 trainer, a PhD student in Toxicology, a social worker, public health workers and other scientists. We are the geekiest board you could find. We love working closely with great local resources like Longmont Humane Society and High Drive Dog Company. We have big plans for the future. We’re looking for a property donation of 2-5 acres within the Fort Collins to Longmont area. We’d like to expand the rescue part of our group along with having a central facility to offer resources. We’d love to have a couple of spaces for people who have fallen on hard times to keep their dog safe until they get back on their feet. We are always looking for volunteers and foster homes. We’d like to believe we are a great group to work with and so far, all the feedback we receive indicates we are achieving that mission. We’re in it for the long haul for both the dogs, and people who love them. As any group, we run on grants and donations, and without that support, we could not do this work. If you’d like to support the dogs and our mission you can check out the myriad of ways at www.coloradog.org/donate.html. We are also on Facebook and Twitter. Come be a part of something great! I found the stubbydog website from reading the August 2014 article in Esquire Magazine titled “The State Of The American Dog”. I also purchased two copies of Karen Delise’s “The Pit Bull Placebo”, one to keep and one to share. I cried all night after reading both items. Although I live on the Western Slope I am so glad to know there are people out there trying to repeal breed specific bans in the Denver area.